The Ohio State baseball team took a trip to Pensacola, Florida, this weekend for a trio of games as part of the Cox Diamond Classic. Riding 15 combined runs of offense to wins over Nicholls State and No. 16 Southern Miss in the first two games of the weekend — both wins, the Buckeyes ran out of steam and couldn’t recover from a shaky outing from redshirt senior starting pitcher Adam Niemeyer in the final game of the weekend against Eastern Michigan. 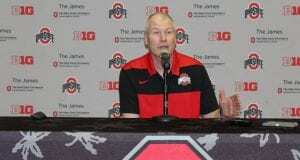 Ohio State’s record now stands at 7-4 on the year. The Ohio State defense committed five errors across the three games this weekend, a small improvement from committing 12 in four games last weekend. In the bottom of the fifth inning, Ohio State junior second baseman Brady Cherry stepped up to the plate with runners on first and second and jumped on the very first pitch. Pushing the ball to right field, Cherry cleared the fence for a three-run home run that put the Buckeyes up 5-1. It was more than enough for an Ohio State win over the Nicholls State Colonels (1-8) Friday by a final score of 6-3. Connor Curlis pitched a gem in his third start of the season for the Buckeyes, allowing just one earned run in 6.1 innings of work with seven strikeouts. Nicholls State sophomore catcher Kyle Knauth produced a large portion of the team’s offense, going 2-4 with a pair of RBIs and his second home run of the season. 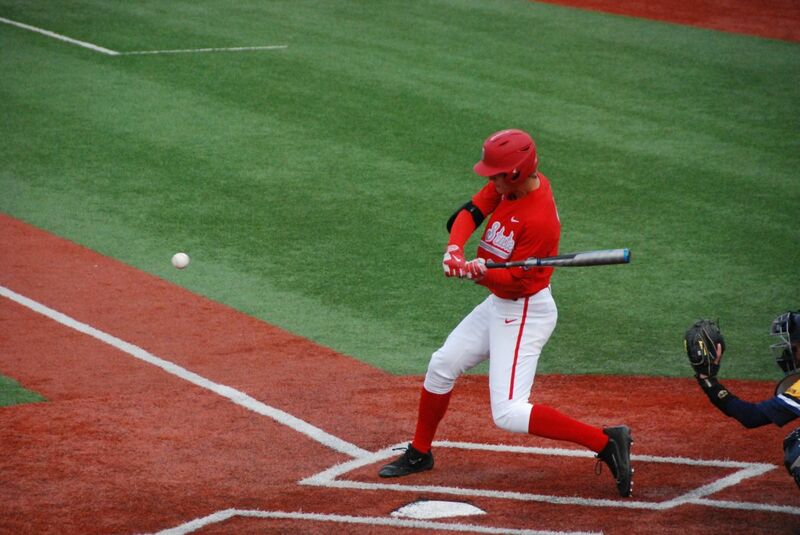 Ohio State junior shortstop Kobie Foppe put in a solid day’s work, going 2-3 with two RBIs. The transfer has been a pleasant offensive surprise for the Buckeyes so far this season, batting .353, 61 points higher than his best season at South Mountain Community College. 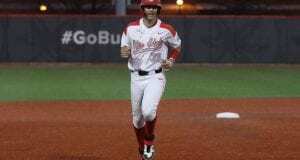 The Buckeyes went from down 6-3 to up 7-6 following a four-hit, four-run inning that included RBIs from junior catcher Jacob Barnwell, sophomore outfielder Dominic Canzone and a pinch-hitting freshman Dillon Dingler. With two insurance runs added in the ninth, senior reliever Seth Kinker delivered his third save of the season after a pair of shutout innings and sealed a 9-6 Ohio State win over the No. 16 Southern Miss Golden Eagles (7-3, 0-0 Conference USA) Saturday. As a whole, the Ohio State bullpen delivered four shutout innings with seven strikeouts spread between freshman Griffan Smith, redshirt senior Curtiss Irving and Kinker. Irving picked up the win (2-0). It was the usual suspects for Ohio State’s offense. Senior right fielder Noah McGowan, named national player of the week two weeks ago, scored four runs and batted home one more. Sophomore third baseman Conner Pohl left the yard for his third time this season as part of a 3-5 day. Canzone finished 3-5 with an RBI and a fourth stolen base on the season. Niemeyer (0-2) gave up six runs, all earned, in just 3.1 innings of work before being relieved by redshirt senior Yianni Pavlopoulos. The offense sputtered and the Buckeyes suffered a 6-1 defeat at the hands of the Eastern Michigan Eagles (3-8, 0-0 MAC) Sunday. The Eagles enjoyed a big day from freshman designated hitter Jared Kauffman, who went 3-4 with two runs scored, an RBI and a stolen base. One bright spot for Ohio State was Pavlopoulos’s performance in relief of Niemeyer. The redshirt senior pitched 3.2 shutout innings. Junior designated hitter Andrew Fishel drove in Ohio State’s lone run of the game.